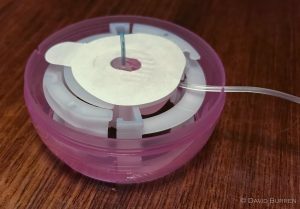 As an insulin pump user, when we insert a new cannula we usually need to tell the pump to “fill” it to ensure that insulin deliveries are accurate. After rewinding and priming the pump reservoir and filling the tubing, the cannula is inserted into the skin. The teflon cannula starts off with an introducer needle down its centre, which is withdrawn once the cannula has been inserted through the skin into the subcutaneous tissue. Once that needle is removed it leaves a void, and unless it’s immediately filled with insulin, the initial flow of insulin will be wasted filling up this space instead of having an effect on our bodies. The way we do this fill depends on the pump model, and the volume depends on the cannula model. This issue doesn’t exist with most steel cannulae like the Sure-T, Rapid-D, or Contact Detach sets. With those the cannula is its own introducer needle which is filled before insertion, and no filling is required. Check the instructions of your pump: the terminology varies (even between subsequent models from the same manufacturer). It might be called something like “prime”, “fixed prime”, or “fill cannula”. Or your pump may have its own pictogram for it. The Accu-Chek Combo pump doesn’t have a separate fill function, and you’re told there to use a small bolus instead. That should all be straightforward, but there can be a complication! The above amounts work for the standard application of the sets, but we don’t always do things the standard way. 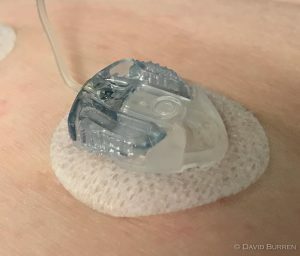 With some infusion sets (such as the Cleo 90 shown above) the tubing starts off as separate from the cannula, and after filling the tubing and inserting the cannula you connect the two and the “fill cannula” operation fills the housing at the top of the cannula plus the cannula itself. But with the Mio / Inset II sets the tubing comes attached to the cannula, inside the inserter mechanism which includes the introducer needle. When you “fill the tubing” it’s filling the housing at the top of the cannula at the same time, and the standard “fill cannula” operation only has to fill the cannula itself. However if you take a shortcut to re-use the same tubing when inserting a new cannula, there is a change you will need to make. Note that this is not described in the manufacturer’s instructions, but there can be many reasons not to change the tubing with every new cannula. 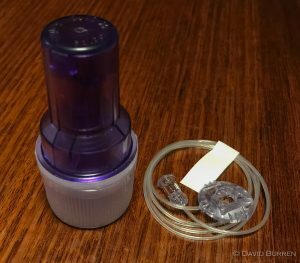 One example is to avoid increasing contamination risks or getting bubbles in the luer-lock connection at the pump end when you’re just replacing a faulty cannula. If you do insert a new cannula without filling the tubing, and then once you’ve removed the introducer needle also remove the new empty tubing and replace it with the existing (full) tubing attached to the pump, you still need to fill the cannula. But you also need to fill the housing at the top of the cannula. Experimenting with 6mm Mio and Inset II sets and observing the fill operations under high magnification, I found that in this particular situation an additional 0.2U of fill is required (i.e. a total of 0.5U of fill). Although I no longer have any 9mm sets on hand to experiment with, given the design of the cannula it seems reasonable to assume that the same additional amount would be required there (thus giving them 0.7U). Remember that if you don’t properly fill the cannula then your next bolus or basal insulin will seem to go missing, so it’s worth getting it right. Thanks Dave, very interesting. I’ve often wondered why some Endo’s said 0.3 or 0.5 etc.